An industry leader for over 30 years, Sun’N’Sand® remains committed to being the #1 source for all your Handbag & Headwear needs. From classic beach looks to the latest surfside trends, all of our products reflect superior quality and functionality. Only top of the line raw materials and quality treatments are used to insure a superior product. We stand behind our products 100%. 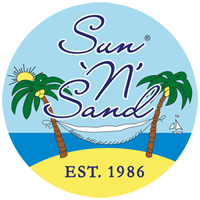 Sun ’N’ Sand® hats are 25-30% less expensive than other leading hat suppliers. Spread your open-to-buy dollars further, get faster turnaround, and better retails. Our entire collection of hats and a large portion of our handbags are open stock - this means fewer fixed assortments. Choose custom colors for your reorders, as needed. All reorders are a low minimum of $100. Sun’N’Sand® is located in the center of the continental U.S., resulting in lower freight, faster delivery, and quicker turnaround. All orders are shipped FOB TX. As always, the highest quality products and superior customer service are our priority. Fashion forward and functional, at fabulous price points makes Sun ’N’ Sand® the natural choice in resort accessories. We hope you enjoy our newest collections. Our Brands are unique and on target with the latest trends. The National Health and Wellness Club (NHWC) SEAL OF APPROVAL is awarded to products that pass their vigorous reviews and testing, ensuring that each selected product meets their highest quality standards. The NHWC provides detailed specifics of Health & Wellness. For more information, please visit - healthandwellnessclub.com. Headwear awarded the NHWC SEAL OF APPROVAL is indicated, along with selective Sun’N’Sand® UPF headwear, all designed to help block harmful UV rays. In addition to sunscreen, choosing a tight weave 3.5” or wider, brimmed hat can dramatically reduce overexposure to harmful UV rays from the sun.